This is one of those recipes that I took with me to college. I started making these apple brownies back in high school. And have made them once a year or so since. I have no idea where the recipe originated, since it's written on an index card and is over 20 years old. Cream shortening, gradually adding sugar. Add eggs one at a time. Combine flour, salt, soda and cinnamon. Add to creamed mixture. Fold in apples. Pour in 9 x 13 pan. Bake at 350* for 25 minutes. Remove and spread with frosting when slightly warm. Cream butter and cream cheese, gradually add sugar; beat until light and fluffy. Stir in vanilla and pecans. Even though it isn't apple season right now, these brownies hit the spot year-round. Enjoy! This sounds like a nice moist brownie that will have a fresh taste. dat is wel mijn ogen uitsteken.......het water loopt uit mijn mond. Sounds real good, I think I may have tried these with some raisins. Yummy... thanks for this recipe! I did a screenshot of this recipe....am going to try it soon. It looks and sounds delicious!! Sounds yummy. Bet my grands would like them. I'm copying the recipe. Thanks! How does your husband stave off obesity? If I had good things like that, comfort food to go with coffee, I'd be the 500 pound guy they had to bury in a piano box. Awesome! My only question is...why do you only make them once a year? 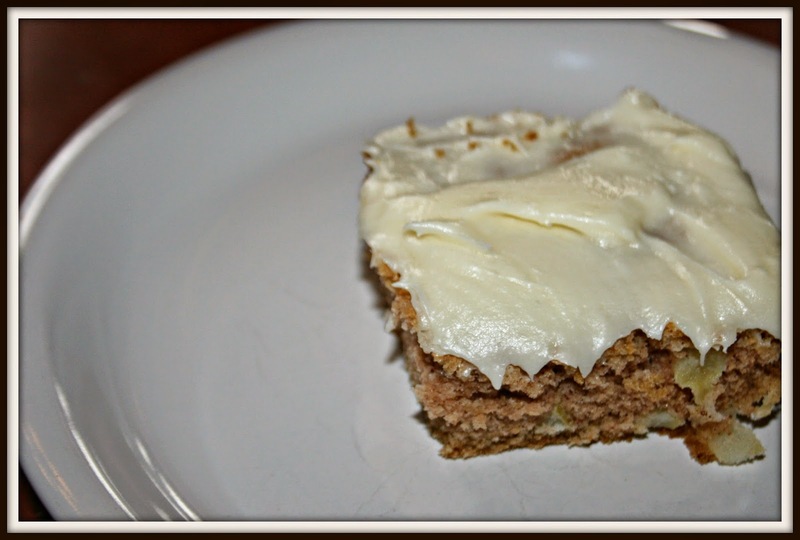 I'm not much for apples, but that cream cheese frosting I could eat all by itself! I'll have to give that a try! It looks and sounds really good! They look so good and seems to be delicious! I have never heard of apple brownies and will have to try them, they look delicious. These sound DELICIOUS! I like all apple desserts! I think I would eat cream cheese frosting on top of pretty much any baked item. It's just so darned yummy.